Being in an auto accident can be scary, especially if you have been injured. Seeking compensation for your injuries or property damage can be a lengthy and complicated process. The experienced auto accident injury lawyers at The Edwards Law Firm will work with you to help you get the best results possible in your auto accident case. Tens of thousands of auto accidents occur each year, many caused by drivers that have failed to yield the right of way. 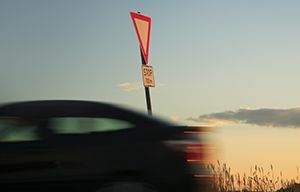 In fact, failure to yield is the second most common cause of car accidents in the United States. Drivers who fail to yield and cause an accident are considered to be negligent in their behavior. Those who have been injured by negligent drivers are able to seek compensation for their injuries or damages. If you have been injured in an accident by a negligent driver(http://www.edwardslawok.com/causes-of-auto-accidents.html) who did not properly yield, then your experienced auto accident injury lawyers will be able to help you seek compensation for the damages. As the plaintiff, you must be able to show that the negligent driver failed to use reasonable care while they were driving. Those who are driving have a duty to act reasonably during the current circumstances. If the driver who caused the accident is found to not have exercised their reasonable duty while driving, then they can be considered negligent and you will be able to seek compensation for the damages. You may be able to collect damages for medical care, damage to your property, any wages lost, or any other physical, emotional, or mental injuries sustained from the accident. If you have been in an auto accident, contact the experienced auto accident injury lawyers at The Edwards Law Firm. Our team of legal professionals has years of experience in helping people like yourself who have been injured or who have sustained severe injuries in auto accidents.